E is for Explore! : 3 in a Row: Vocab. 3 in a Row: Vocab. Classic Spelling Tic Tac Toe: Kids choose three activities in a row, to do with their spelling or sight word list throughout one week. 2. Fraction Words - count up the total number of letters in their word. Then count the vowels and consonants and write a fraction for the vowels and consonants. 7. Word Patterns - Write letters of each word in different colors to create various patterns. 9. 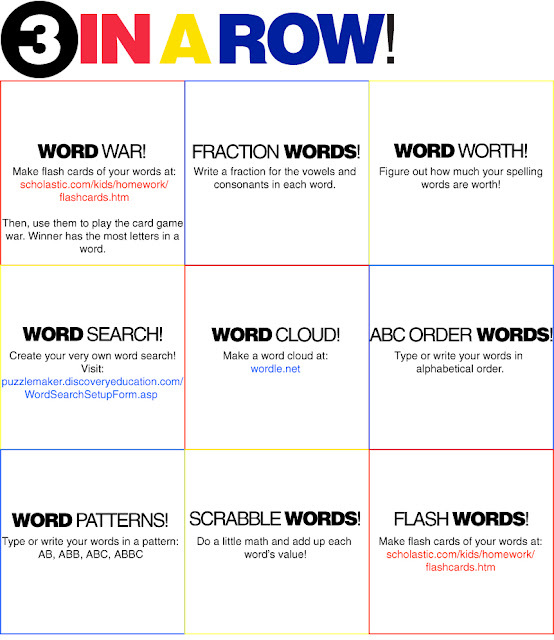 Flash Words - flashcard maker, also use for word war. Kids could simply write words on index cards if they don't have access to a computer or printer at home.